“Enjoy the Taste of Eating Right” is the theme for the National Nutrition Month! How well do you eat each day, week or month? At FWL we want you to eat right for a healthier life. Once you reach and maintain a healthier weight, your overall health and well-being will improve. Instead of focusing on your weight as a number, focus on the big picture and what losing weight will mean for you and your health. Make a plan for lifelong health. Set healthy, realistic goals: make changes step-by-step, not all at once. Start with one to two specific and small changes at a time. Create a plate of variety: half plate should be fruits and vegetables, one fourth with lean proteins, and one fourth with grains. Focus on your food and avoid other distractions. Sit down to eat, turn off the television, computer, phone, etc. and focus on eating only. Stop eating before you feel full or stuffed. Eat slowly and chew your food well. Eat on a smaller plate, so you consume fewer calories. Find a balance between food and physical activity. Make sure you try to get more physically active throughout your day and perform some form of physical activity for at least 30 minutes 5 days per week. 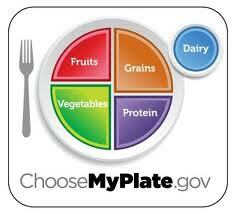 For more information on a personalized eating plan, go to www.choosemyplate.gov. Answer the questions below and add up your score. 16-20 points: Healthy eating seems to be your habit already! Keep up the great work! 10-15 points: You’re on track. A few easy changes will make your total eating plan healthier. 0-9 points: Sometimes you may eat smart. For good health, add more smart choices to your eating plan!